Strength training will increase the neuromuscular efficiency within the muscle and only increase in size to it’s genetic potential. Women do not produce the same levels of certain hormones as men nor do women have the same genetic potential (in terms of muscle size). Very few women can achieve a female body builder physique and it is done through years of hard work and a very specific nutrition program…and sometimes, unfortunately, steroids… Strength training will improve muscle hypertrophy slightly and will give muscle it’s definition, but not to the point of being bulky. 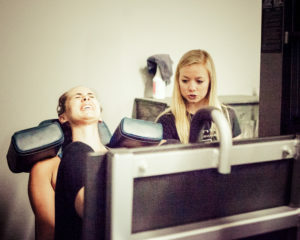 Women and Men need to lift the amount of weight appropriate for them to achieve muscular fatigue in order to stimulate the body’s natural response for adaptation. Trainees who lift weights that are too light will not stimulate the muscle to grow. Choosing appropriate weights and exercises along with proper nutrition will optimize muscle growth. In order for men and women to look ‘toned’ they have to lose enough body fat to see definition of their muscles. Women should continue an exercise regimen approved by their doctor while pregnant which includes strength training. Women who have been strength training preconception can continue strength training throughout their pregnancy with a doctors approval. Some exercises may have to be modified, but overall strength training shouldn’t cause problems. Women use every ounce of muscle and energy during labor so it should make sense to train those muscles in preparation. Women who strength train during pregnancy usually see a quicker return to activity after the birth of their child. Strength training will burn more calories long term than a cardio session equivalent in time. We have already covered this point in a previous post, but in short you will burn more calories over the long run by raising your Resting Metabolic Rate (RMR) for the next 2-3 days after a strength training session than the quick ‘fat’ calories burned during cardio. See our previous post here for these details. As women age, they should strength train to prevent effects of age-related disease/Sarcopenia. As we age, at some point in our 30s we begin to lose anywhere between 3 and 5% of muscle tissue and function. As early as age 65, this percentage begins to increase, leading to a much higher risk of falls, osteoporosis, among other risk factors associated with age related disease. Proper strength training can help to slow these age related issues. That being said, in order to keep optimum muscle mass, the trainee has to continue stressing their musculature. Training to fatigue usually means weights are increased over time as the goal repetition range is met. No one can maintain muscle mass by continually using the same weights, your body is either building up new muscle or losing muscle, so it doesn’t make sense to limit how much weight you lift. Now as people age they do reach a limit of their individual genetic potential, but must continue to train maximally to stay at their genetic potential. As people age their genetic potential decreases so someone in their 60’s or over may continue to train maximally, but lose some strength and inevitably lift lighter weights. In summary, this should not be confused with lifting lighter because it is safer, weights become lighter because that is what the trainee is capable of lifting. These are just a few points that we hear regularly and want to address to decrease the confusion related to women and strength training. If you have more questions please use our contact page!